SPRUNG Instant Structures located in Manama, Bahrain, is a member of the Sprung Group of Companies which has been in business since 1887 and has achieved international recognition by providing shelter solutions for thousands of different applications in over 90 countries throughout the world. Sprung is the inventor of the stressed membrane structure, engineered to accommodate the world’s need for enclosed space quickly and economically. This innovative building solution utilises architectural membrane panels placed under high tension within a non-corroding aluminium substructure. Sprung provides an optional superior performing energy efficient insulation package. Widths range from 9 metres (30 ft) to 60 metres (200 ft) by any length. “The non-corroding aluminium substructure and our high-quality performance fabric provide for an incredibly long lifespan. 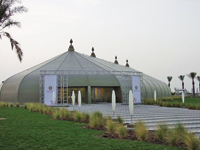 The performance architectural membrane provides all-weather protection from the elements with up to a 20-year guarantee,” says a company spokesman. The benefits of Sprung structures include speed of delivery and construction, large clear span interior, energy efficient insulation package, relocatable design, limited foundation requirements. Each Sprung structure is manufactured from the highest quality products and materials, and individually tested using strict performance measures, he says. “With a specialised high-strength aluminium alloy, our substructure has an unlimited lifespan. Sprung structures are engineered to meet or exceed the requirements of most building codes and standards. Sprung structures are generally available within three weeks of an order. “Our structures are designed and engineered for ease of movement. Sprung structures can be assembled and disassembled in sections and reconfigured for different applications,” he says. All components come to the site pre-fabricated. Arches are raised and the exterior membrane installed within a few days of commencing work. As a result, all contractor services have a roof overhead very early in the erection cycle. This allows Sprung structures to be constructed even in the hottest months of the year, with very little delay. Sprung structures’ military applications including aircraft hangars, on-site warehousing, vehicle maintenance, logistics storage, MWR facilities, dining and food services and access control point shelters.